Last year around this time I was hiking through the Annapurnas. Well almost – I actually just realized that at this time last year I was probably eating dinner at a tiny restaurant in Pokhara, Nepal called The Olive. It was: the best. For some reason, all over Nepal, happy hour consisted of cheap alcohol and… popcorn? I wasn’t mad about it. It’s quite apt that this is exactly what I have decided to make today. I only just realized that. WOO! Paralells! 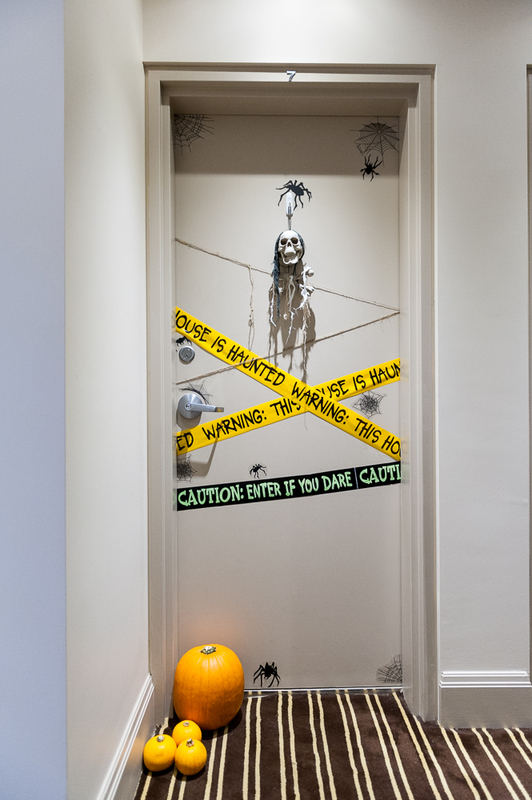 Only door in the building that is decorated. Sean may have mumbled something about ‘excessive’ when he got home from work that night. But I am not be deterred. 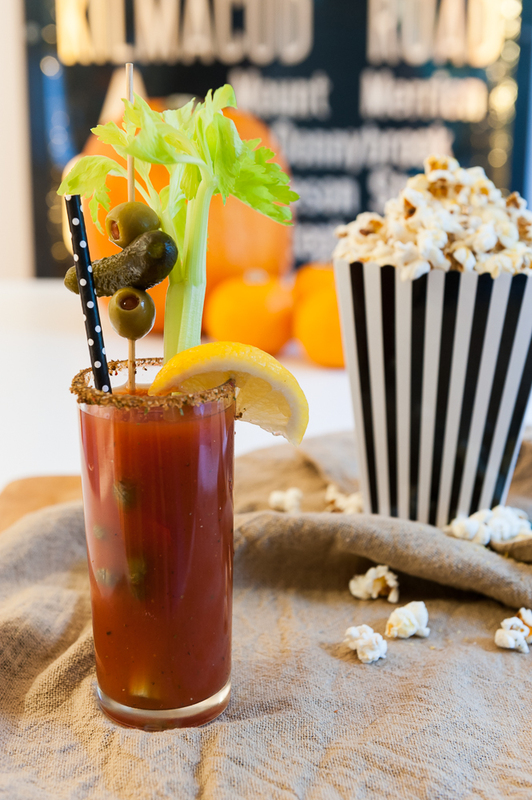 So, while my family is celebrating Halloween and the many family birthdays in Toronto with our annual pumpkin carving party, I am sitting in sunny Sydney carving a pumpkin (which I am sure will rot before Halloween) whilst sipping the Ultimate Bloody Mary and eating the Ultimate Popcorn. Let’s talk about it. Lately, I have wanted a cocktail that is less about the sugar and fruit and more about the savoury. 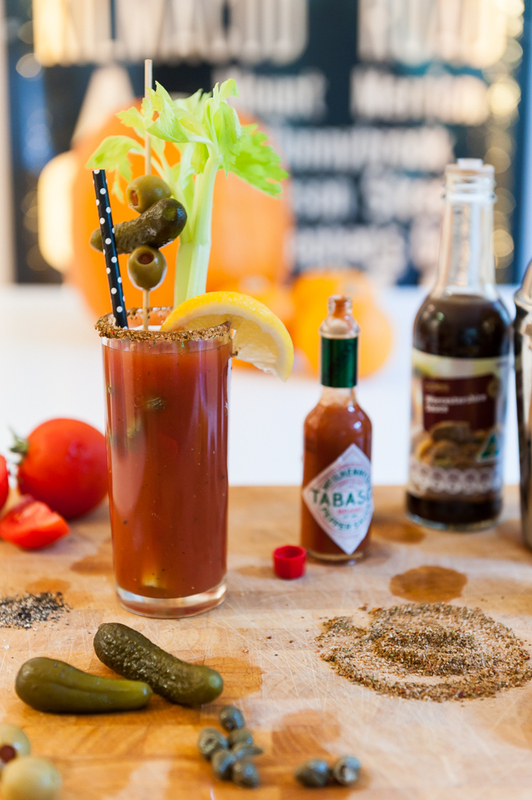 A Bloody Mary is where it’s AT. 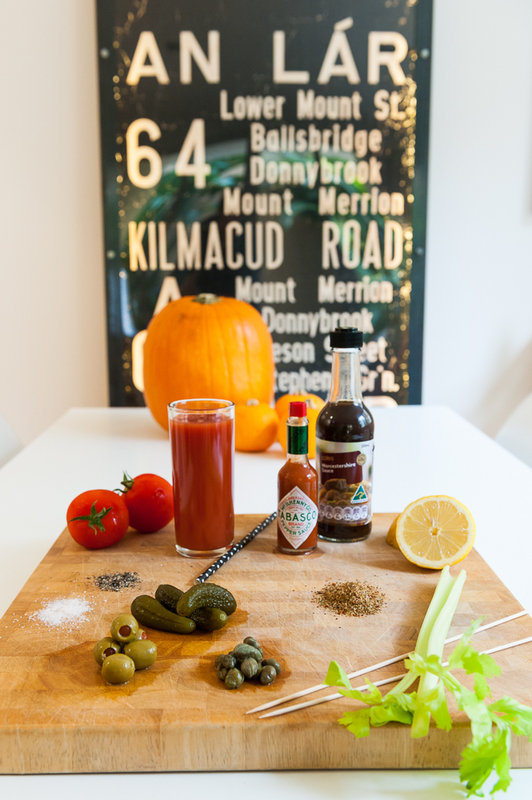 Now if we were in Canada, we might be having a Caesar – but being the vegan that I am -we’ll stick with a Bloody Mary. Let’s partner this delightful cocktail with another salty treat. You might think that Worcestershire sauce on popcorn is like, the weirdest thing ever and it very well might be. But this is how Mama Hicks has been making her popcorn for years and I’m not about to change it. However, I am about to add garlic butter and nutritional yeast. So there’s that. This popcorn is major. All in all – it’s a perfect Halloween combination, whether you’re in Nepal, Canada, or Australia. 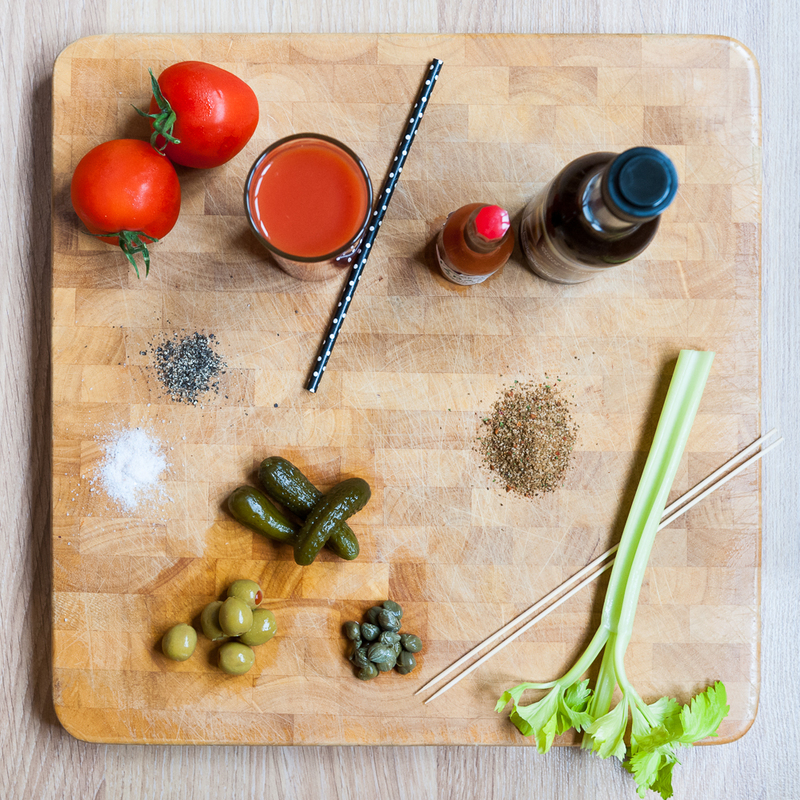 First, Add all the ingredients to a cocktail shaker (minus the tomato juice) and muddle. Fill the shaker with ice & shake for ten seconds until cold. Pour the cocktail into a salted tall glass and top with tomato juice – garnish as you like. This is not a less is more situation. DRINK UP! Melt the coconut oil in large pot over a medium heat. 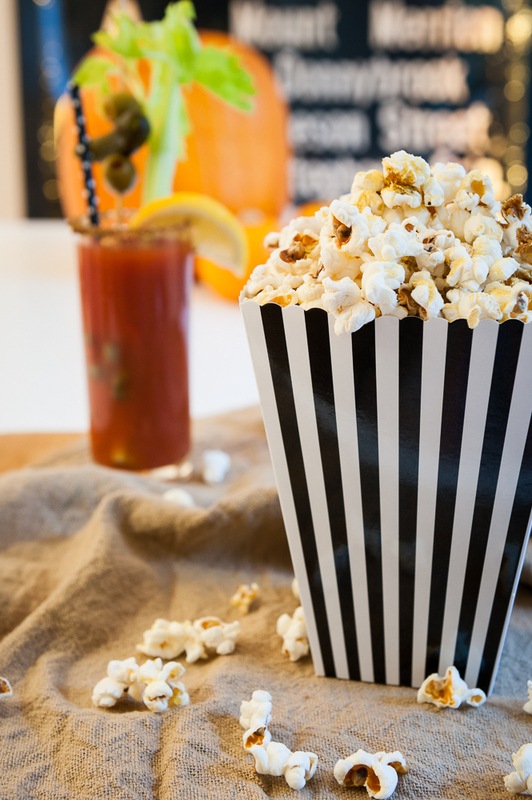 Add the popcorn and a pinch of salt – make sure all the kernels are covered in oil and then cover the pot leaving a crack open for steam to escape. Melt your butter in a separate bowl and add the garlic to it. Wait for popcorn to pop (3-5 minutes) and wait until it begins to slow down – take the popcorn off the heat and allow the kernels to finish popping. Toss the garlic butter, salt, pepper, Worcestershire sauce, and nutritional yeast into the popcorn and mix thoroughly. Nutritional Yeast is, as it’s names suggest, nutritional… but also it tastes a bit cheesey. You could also add parmesan and I’m sure it would be delightful… ENJOY! I work with Jenn and she played The Loved Ones trailer for us after work. I’m still getting over it. The nutritional yeast is sitting in my cupboard — going to have to try that next time. Coconut oil seems more authentic than canola too. Thanks for the tips!